In November 2015 thirteen boxes filled with an archive of about 1000 78-rpm disc records were delivered to the Center for Mallet Percussion Research at Kutztown (PA) University. The purpose was to establish a permanent residence for the archive and to make its contents accessible to anyone interested in pursuing research on the performers and the music represented in the recordings. Along with the 78-rpm records was a digitized version of the entire collection of 1280 titles (all contained on one 16-gb thumb drive) and three indexes to enable easy access to specific recordings. Following below are the “Notes” that accompanied the digitized recordings along with links to the three Indexes. The Archive of Acoustic Records Featuring the Xylophone is the result of a project that began in the year 2000. The original plan was that the entire collection of Bill Cahn’s 78 RPM records featuring the xylophone would be converted to a compact disc format as a way to preserve the many fantastic performances that were recorded so long ago, before the technical possibility of editing. The project was implemented by three producers: Conrad Alexander (Assistant Professor of Performance Studies at Ithaca College), Heather Thorn (Orlando-based freelance xylophonist / percussionist). and Bill Cahn (founding member of the Toronto-based NEXUS percussion group and Associate Professor of Percussion at the Eastman School of Music – 2006 to 2015). It has been more than a century since the invention of sound recording by Thomas Edison. In the years since then, technical improvements in the quality of sound reproduction have repeatedly been introduced. One of the side effects of these ongoing improvements has been the gradual loss of earlier generations of recordings, along with the performances that those recordings embodied. Acoustic process, electric process, Hi-Fidelity LP, stereophonic sound, reel-to-reel tape, 8-track tape, audiocassette tape, direct-to-disc LP, compact disc and digital audio files – all have given way to succeeding generations of sound recording technologies. Not only the disc records and tapes, but also the equipment – the phonographs, cassette and CD players, etc. necessary for the records to be played – has become increasingly difficult to find and maintain. It appears likely that virtually all recorded sound will eventually be preserved as data on the cloud – centralized data banks operated by major companies. This archive is primarily intended to preserve some of the performances of the many wonderful musicians who performed on the xylophone during the era of acoustic recordings. The recorded sound of a xylophone was particularly favored by the acoustic process – a mechanical (non-electric) process which transformed the pressure of sound waves directly into vibrations on a sound-sensitive diaphragm fitted with a needle that could cut microscopic indentations into a rotating or revolving groove on a cylinder or disc made of a malleable but durable material. The archive was motivated under the premise that, over the long term, digital files will have a better chance of preserving these performances than the original 78 RPM records, which are not only somewhat fragile, but also very bulky to store and heavy to transport. All of the digital recordings in the archive were converted directly from the original 78 RPM records. Virtually all of the 78 RPM records were played on a Garrard “Synchro-Lab Series Automatic Transcription” turntable, fitted with a Pickering D1527 floating stylus for 78 RPM records. Most of the recordings were also processed through a McIntosh C-20 (tube) pre-amp, which has filters designed to remove some of the unwanted groove noise. Generally, the C-20 pre-amp added a slight mid-range gain in volume while also reducing some of the upper-mid-range frequencies. The process of converting the records was initially started by Heather Thorn and Conrad Alexander in 2001. Over the following years, as available time allowed, Heather kept the process moving forward until virtually all of the records except for the Edisons, Pathes, and 12-inch 78s were converted. Most of the mp3, aiff and wav audio files in the archive were recorded by Heather on a Dell Latitude CPI laptop computer using Polderbits software to record and GoldWave software to convert to mp3 files. The Edison and Pathe records (which have “hill and dale” vertically-cut grooves) and the 12-inch records were finally converted in 2014 by both Heather Thorn and Bill Cahn on a Mac PowerBook G4 laptop computer using GarageBand software The GarageBand files were then converted by Bill Cahn to the m4a format on a MacBook laptop computer. The sound quality of the digital files in the archive is certainly not at the high standard of modern commercial digital recordings. Many of the 78 RPM records had well-worn grooves, decades of accumulated dirt, or other kinds of damage that generate noise upon playback. A conscious decision was made to obtain the best possible sound on the available equipment to convey the quality of the performances, even if the resultant sound included a considerable amount of background hiss or snap-crackle-pop noise. The idea was to try to remove as much noise as the equipment and software would allow, but with minimal distortion of the performance sound. Perhaps there will someday be a technology capable of restoring the files to a sound quality that is closer to the original live sound. The (unedited) performances that were recorded in the early part of the 20th-Century, provide a window into the North American culture at that time. Prior to World War 1 the music featuring a solo xylophone is largely comprised of arrangements of classical works and popular songs. From the end of World War 1 (1918) until the end of the acoustic recording era (1929) the music featuring the xylophone mostly consists of dance music, which could be comfortably presented within the 3-to 4-minute time limitation of the 10-inch 78 RPM disc. While on first hearing, there is a sense of familiarity with the music, there is also an immediate awareness of style – the nuances in the performances that are specific to the culture of that time. Examples are the generous use of portamentos (sliding sounds) in the solo instruments and the rhythmic energy in the dance music provided not by the drums, but by the xylophone. One of the challenges for listeners today is to perceive the music beyond its veneer of style in order to capture a sense of the excitement and freshness that would have been in the ears and minds of listeners when the music was first performed. 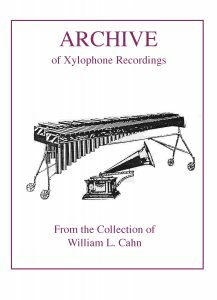 It is the sincere hope of the producers that their efforts to realize this archive of recordings featuring the xylophone will ultimately make it possible for future listeners to appreciate the incredible musicianship that is so evident throughout the collection. If future listeners are enabled through this archive to experience some of the many joys and surprises that are present within these performances, then the intent of the producers will have been fulfilled. The archive is accompanied by three Indexes to facilitate access to its contents. Heather Thorn is an accomplished artist whose performance career spans the fields of music, acting and modeling. In 2011, Heather was a featured guest artist on xylophone in the Michael Andrew Swingin’ Christmas show. She was also a member of the PAS 50th Anniversary Marimba Orchestra under the baton of Gordon Stout. Heather has performed with the Asheville and Fayetteville Symphonies and has appeared as a soloist with the percussion ensembles of University of North Carolina- Asheville, University of North Carolina-Greensboro and Ithaca College. She was a proud member of Gordon Stout’s Marimba Band for two years. Heather also performed with the musical trio Triplets, which featured her as a xylophone soloist. Other notable performances include appearing as a soloist in the Sound Celebration Concert – a benefit for the Georgian Bay Symphony in Owen Sound, Ontario, First Night of Asheville New Year’s celebration and as a xylophonist at Universal’s Islands of Adventure. Currently, Heather resides in Orlando, Florida where she performs and has a private studio of more than 45 percussion students. She also works regularly as a clinician and guest artist in many of the area schools and co-directs the percussion department at Trinity Preparatory School. She is band leader for her groups Vivacity and Home Town Heroes, which feature her on the xylophone. Heather performs with the Walt Disney Orchestra and with Michael Andrew and Swingerhead. She also has her own solo vaudeville show featuring an original character Xillie the Xylophonist. Heather has a passionate interest in the history of xylophone and she worked with Bill Cahn on the project to digitize and preserve nearly 1500 recordings of xylophone and percussion music from 1898-1929. Heather holds a Bachelor of Music degree with a minor in theatre from Ithaca College. She has attended the Leigh Howard Stevens Marimba Seminar and the Bob Becker Ragtime Institute. Her teachers have included Gordon Stout, Bob Becker and Byron Hedgepeth. Heather plays a Malletech Bob Becker xylophone. Bill Cahn has been a member of the NEXUS percussion group since 1971 performing with symphony orchestras and in solo concerts worldwide . He is an Associate Professor of Percussion at the Eastman School of Music and a visiting artist in residence at the Showa Academy of Music in Kawasaki, Japan. Bill was the principal percussionist in the Rochester Philharmonic Orchestra from 1968 to 1995. He has performed with conductors, composers, ensembles, and artists representing diverse musical styles, including Chet Atkins, John Cage, Carlos Chavez, Aaron Copland, Sir Andrew Davis, Chuck Mangione, Mitch Miller, Seiji Ozawa, Steve Reich, Doc Severensen, Leopold Stokowski, Igor Stravinsky, Edgar Varese and Paul Winter. He has conducted family and pops programs with symphony orchestras, and his compositions for solo percussion, percussion ensemble and percussion with orchestra/band are widely performed. His fourth book, “Creative Music Making,” on freeform improvisation was published by Routledge Books in 2005. In 2006 Bill received a Grammy Award as part of the Paul Winter Consort on the DVD titled, “2004 Solstice Concert”. Conrad Alexander studied at Southern Methodist University, and received a Performer’s Certificate at the Eastman School of Music. His teachers include John Beck, Don Liuzzi, Kalman Cherry, Doug Howard, John Bannon, Charles Owen. He is Assistant Professor of Performance Studies at Ithaca College, and he also teaches at Mansfield University (PA), the Brevard Music Center (NC). He has taught at Interlochen Center for the Arts, James Madison University, University of Virginia, the Odessa/Midland (TX) school system and the Blue Lake (MI) Fine Arts Camp. He has performed with the New York City Opera Touring Orchestra, the Albany and Harrisburg (PA) Symphonies, as well as the Dallas, Richmond (VA), Greensboro (NC), Knoxville (TN), Oklahoma, and Anchorage Symphonies. He is the owner of DAY Percussion Repair, www.daypercussionrepair.com, specializing in all facets of keyboard modification and percussion instrument repair.